Summer is moving by quickly, it doesn’t seem like it should be August already but it is. It hasn’t been very long since the last newsletter so I don’t have a lot to share. Our second quarter meeting was hosted by Larry and Ramona Meservey in Trenton, MO. We had a great meal with the meeting following the meal. Afterward most everyone made the couple minute trip to Larry and Ramona’s home to visit their collection which was out on display. A big thank you to Larry and Ramona for putting everything together and hosting. Our next membership meeting will be at our state show that will be hosted by the Platte County Steam Engine Association, August 10-12 in Tracy, MO. At the meeting we will be voting on three directors that are up for election, the directors whose terms are due Andrew Dawson, Greg Harrell and Rob Goodding and they have all agreed to run again, Tom Lindley and Doug Climer have also been nominated. Thank you to Bert for doing the newsletter and website the past several years it takes a lot of time and with a new job it was taking too much time. I know Libby will do a great job with it and have no worries! I hope everyone has a safe and happy summer and I hope to see everyone at the state show. The 3rd Quarter Meeting of the IHCC Chapter 1 will be held Saturday, August 11th, 2018. The meeting is in conjunction with Platte County Steam Engine Show, Platte County Fairgrounds, and Located at 1st & Treble Street, Tracy, MO. Lunch will be served at noon with the meeting following at 1:00 pm. The Directors are asked to meet at 10:30 am for the Quarterly Directors meeting. Thank you for hosting 2nd Quarter Meeting! To Larry and Ramona Meservey, they invited all of the members to their beautiful home in Trenton, MO. to view their awesome IH and more collection. 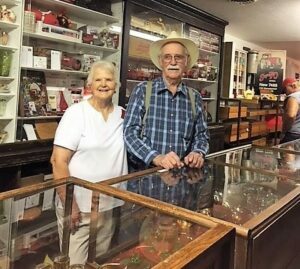 Larry has a wonderful display of memorabilia and just a few (lots) of Red tractors. A delicious lunch was served at the Red Barn Venue in Trenton prior to the meeting. It is with heavy heart that I am informing the Chapter that I have decided to step down from being the Membership Secretary. With my full time job acquiring more locations and my recent promotion to Operations Administrator Manager things have become busier for me. Also, my job has asked me to go to college so that is taking up a lot of my free time that I had when I agreed to become Membership Secretary. Followed with mine and Joey’s side business, as it is steadily growing each month. If anyone would be interested in becoming the Membership Secretary please let me know and I would be more than happy to show you the process. Thanks for this opportunity to be the Chapter 1 Membership Secretary for the past 4 years. I plan to still be a member of the club and try to make it to meetings if time permits. to setting up at the state show. Hello, My name is Libby Youse from Shelbina, Mo. I wanted to thank the Directors of Chapter 1 for entrusting their quarterly newsletter to me. The goal is to send a newsletter out about 3 weeks before the quarterly meeting to allow everyone to get their calendars marked. I apologize right off the get go because this one is not going to make that cut off as I am having a late start. I also want to thank Bert Dawson for all the work she has been doing on the newsletter for the last couple of years. If you do not get the newsletter in the form you would like, either by email or mail please let me know. I look forward to serving the members of IHCC Chapter 1 in this capacity.